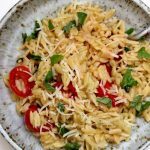 Orzo pasta is tossed with fresh basil, garlic, halved cherry tomatoes and parmesan cheese for a perfect side dish or meatless meal. Turn your Instant Pot to the saute function. When the display says HOT add in the olive oil and swirl it around. Add in the diced onion and saute for about 3-5 minutes. Add in the garlic and saute for 30 seconds. Add in the chicken broth and scrape any bits off the bottom of the pot. Add in the orzo, salt and pepper. Turn off the saute function. Cover the pot and secure the lid. Make sure valve is set to sealing. Set the manual/pressure cook button to 1 minute on high pressure. When the time is up let the pot sit there for 5 minutes and then perform a quick release. Remove the lid and stir in the basil, cheese and tomatoes. Scoop onto plates and enjoy!